Fifty years ago, the United States and Canada transformed power production and flood control in the Columbia River Basin. Following two decades of studies and negotiations, as well as devastating flooding in 1948, the Columbia River Treaty (CRT or Treaty) authorized the construction and operation of a series of storage dams and established an international legal framework that continues to govern hydropower and flood control in four U.S. states (Washington, Oregon, Montana, and Idaho) and the Canadian province of British Columbia. The future of the CRT is somewhat unsettled. The 1964 Treaty may operate indefinitely, as it has for the past 50 years. Article XIX of the Treaty, however, allows the United States or Canada to terminate the CRT after 60 years, in 2024, if the other side is given 10 years’ notice—a notification that either entity can render as early as September 2014. Moreover, the flood-control provisions under the Treaty automatically change in 2024, at the conclusion of the first 60 years. Because of the possible termination as well as automatic changes in 2024, both U.S. and Canadian interests have been assessing the benefits and scope of the CRT over the past few years. The results of any future renegotiation of the CRT could have far-reaching impacts on electricity supply, flood risk management, navigation and commerce, agriculture, water supply, and aquatic and other resources—affecting millions of U.S. and Canadian citizens across the Northwest for decades to come. A recent letter from the full congressional delegation of the four Columbia River Basin states described the potential renegotiation of the Treaty as “an issue of paramount importance for the entire North- west.” This article briefly outlines the background and importance of the CRT, assesses its impact on the Northwest since 1964, and looks at the issues that are arising as U.S. and Canadian negotiators evaluate its future. The 1,200-mile-long Columbia River is the largest river in the Northwest. Its headwaters are in the Rocky Mountains in British Columbia; the river then runs south through Washington and demarcates the Washington–Oregon border as it flows west to the Pacific Ocean. Its drainage basin encompasses large parts of Montana and Idaho, as well as nearly all of Oregon and Washington and a significant portion of British Columbia. Because the Columbia passes through some of North America’s highest mountains, the river has a high gradient (averaging more than two feet of elevation loss per mile over the length of the river) ideal for generating hydroelectric power. In addition, the region’s topography and climate mean that substantial amounts of rain and snowpack ultimately flow or melt into the river. While the United States and Canada had previously taken some steps toward managing water resources jointly—for instance, through the 1909 Boundary Waters Treaty, and initial studies on the Columbia River in the early 1940s—the 1948 flooding added a new impetus for more active management of the Columbia’s flows. The 1948 flood events were tragic, leaving dozens dead and thousands homeless as Vanport (a city that once neighbored Portland, Oregon) was destroyed. Canada agreed to build three storage dams to provide 15.5 million acre-feet on the tributaries of the Columbia River to improve the river’s flow, with the United States also building a storage dam in Montana. Storing water allowed for control of flooding by regulating annual flows and benefit- ted hydroelectric production. Canada also constructed its own hydroelectric generators at two of its three Treaty dams. John M. Hyde, Columbia River Treaty Past and Future, Hydrovision, p. 4 (July 2010) (Hyde). Upon completion of the dams in 1973, the United States paid Canada $64.4 million as compensation for flood control for the first 60 years of the Treaty. Hyde at p. 5. Under the Treaty, U.S. and Canadian representatives—designated as “Entities” collaborate closely to track river flows, assess seasonal storage needs, and calculate power benefits. The Canadian Entity is BC Hydro, and the U.S. Entity is composed of the Bonneville Power Administration (Bonneville Power) and the U.S. Army Corps of Engineers. Within the scope of its goals—specifically, flood control and hydroelectric power—the CRT has been largely successful over the past 50 years. However, the Treaty did not directly address additional issues related to management of Basin flows. The United States and Canada have therefore confronted these issues outside of the Treaty framework. One example is the treatment of fish populations and migrations, which is a major cultural, ecological, and economic issue for the region. In the United States, these and other issues have been addressed through modern environmental programs, such as the 2008 Biological Opinion governing agency actions for the Federal Columbia River Power System and the 2008 Columbia River Fish Accords, as well as requirements of Federal Energy Regulatory Commission nonfederal hydropower licenses. One of the most important benefits of the CRT is the ability of the storage dams to regulate flows that would otherwise lead to more significant flooding. The U.S. and Canadian storage dams proved vital during 1996 floods, for example, by reducing downriver flooding. In contrast to the 1948 floods, the floods of 1996 resulted in far less property damage and fewer lives lost, stopping short of flooding Port- land. Although the floods still caused significant damage, the storage dams may have saved downtown Portland because the floodwalls were nearly inundated even with the storage capacity added after the 1964 CRT. Since the storage dams were completed in 1973, peak flows have consistently been held below previous historic highs. Hyde at 5. In terms of power benefits, the increased predictability and flexibility of river flows benefit power generation at 31 federal and several nonfederal Columbia River dams. 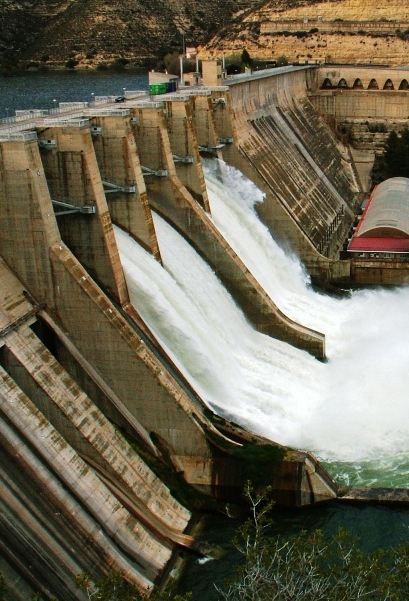 In all, the United States installed over 37,000 megawatts of hydropower capacity along the river. Hyde at 2. The CRT, as noted above, requires the United States to transmit to Canada half of the downstream power benefits, the “Canadian Entitlement,” which amounts to $250–$350 million in electricity per year according to the U.S. Entity’s calculations. Importantly, the United States determines the Canadian Entitlement based on estimates made five years in advance rather than on actual annual flows. These estimates do not account for elements such as fishery needs, agriculture, non-Treaty reservoirs and storage dams, or fluctuations from rain and snow variability. As a result, the U.S. Entity has determined that the current calculation of the Canadian Entitlement significantly overstates the benefits provided by Canadian storage and that the downstream power value of Canadian storage should actually be roughly $26 million worth of electricity per year. U.S. Entity, Columbia River Treaty 2014/2024 Review (Apr. 2013). Finally, the CRT allows for improved transmission infrastructure across the region through a complex set of power trades. For the first 30 years of the Treaty, BC Hydro sold the Canadian Entitlement to a consortium of Northwest U.S. utilities. BC Hydro used this cash flow to further finance the Canadian storage dams. The utilities then exchanged the variable Canadian Entitlement power—which, as noted above, could shift up or down based on calculations made years in advance—for a fixed amount of power from Bonneville Power. In turn, the consortium then sold its (now-stable) power allocation from Bonneville Power to a group of California utilities. This long-term, stable power transaction allowed for the construction of several of the major transmission interties between California and the Northwest. Today, Canadian Entitlement power is physically delivered to BC Hydro and marketed by Powerex, a BC Hydro subsidiary, in the western United States and Canada. These sales are an important source of revenues for British Columbia, but the Treaty-mandated power flows have also been criticized as a source of transmission congestion requiring curtailment of other transmission users. A half-century after its ratification, the CRT is now at a crossroads. Even if the CRT remains in effect, flood control measures would change substantially in 2024. Rather than providing a set level of storage automatically, Canada will provide storage only when “called upon”—and compensated by—the United States. This type of storage is included in the current CRT but has never been used because for the first 60 years the United States purchased it in advance. Additionally, the Treaty requires that the U.S. Entity “call upon” Canadian storage only when U.S. dams cannot meet the need for flood control. This means that beginning in 2024, U.S. dam operators might need to shift their operational priorities toward flood control rather than hydropower, or other priorities in some cases, and that U.S. and Canadian storage operations would be less coordinated than under the current system. In light of these possibilities, both the United States and Canada are looking ahead and evaluating negotiation options as the 10-year mark for termination approaches. The U.S. Entity began a Treaty review process in 2010. Initially, this review included only a Sovereign Review Team consisting of federal, state, and tribal entities. Later in the process, the U.S. Entity held public meetings and solicited comments from a wider range of stakeholders, including power producers, water supply entities, environmental groups, flood control and port representatives, and other interests. After two initial drafts (each of which invited public comment), the U.S. Entity delivered the “U.S. Entity Regional Recommendation for the Future of the Columbia River Treaty after 2024” to the U.S. State Department in December 2013. The U.S. Entity recommended that the State Department renegotiate the CRT with Canada by 2015, and specifically suggested “modernizing” the Treaty in three main areas: (1) hydropower, including rebalancing of the Canadian Entitlement, (2) extension of coordinated storage operations, and (3) more formal integration of ecosystem issues in the Treaty. The recommendation included incorporation of water supply, navigation, recreation, and climate change elements as well, albeit in less detail. The State Department now must decide whether it will seek to renegotiate the Treaty, and, if it does, which issues to focus on. In April 2014, the entire congressional delegations of Washington, Oregon, Montana, and Idaho wrote to President Obama, urging the opening of negotiations with Canada and for the State Department to remain in close contact with regional stakeholders throughout the process. The delegation letter also reiterated the recommendation of the U.S. Entity that negotiations begin in mid-2014 and conclude by the end of 2015. For its part, in April 2014, the provincial government of British Columbia announced its decision to continue the CRT, while seeking changes within its existing framework. As with the U.S. Entity, the provincial government had engaged in several years of discussions with stakeholders, including local governments and First Nations (Canada’s indigenous peoples). British Columbia’s decision seeks a broader valuation of U.S. benefits from Canadian storage in areas such as ecosystems, tourism, water supply for municipal and agricultural uses, and navigation. The provincial decision pledged to explore ecosystem improvements but explicitly stated that salmon migration upriver into Canada would not become a CRT issue. The Columbia River Treaty’s renegotiation and possible termination represent a significant and unique opportunity for the entire Northwest. The outcome of negotiations could substantially impact energy producers, fish recovery, tribes, and the millions of people who live in the region or depend on its vast resources. While the Treaty accomplished its most immediate goal of preventing another disaster like the 1948 Vanport flood, preserving this vital function beyond 2024 faces the modern challenges of balancing a finite resource among competing public values, and high-level policy decisions as to whether those values are better addressed through international agreement or established domestic programs. Originally published in Trends July/August 2014, Vol. 45, No. 6, (c) 2014 by the American Bar Association. Reproduced with permission.